Blueberry diapers were launched in 2007. 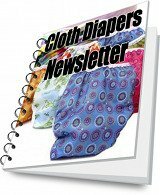 The line of cloth diapers is made by the same company that make Swaddlebees diapers and offers all in one cloth diapers, pocket diapers, diaper covers and other accessories. Blueberry Basix aio cloth diapers come in gorgeous, bright solid colors and fun prints. While this diaper is an all in one diaper, it has been designed with pocket openings to allow you to add an insert for a little extra absorbency if you need it. This diaper has a waterproof polyurethane laminate (PUL) outer layer combined with absorbent layers of microfleece and microfiber terry cloth fabric. Blueberry Basix aio cloth diapers cost approximately $17 per pair, and come in the following sizes: newborn - 6-12 pounds, small - 8-16 pounds, medium - 12-25 pounds, large - 22-35 pounds. Blueberry Training Pants are aio toddler training pants. These cotton velour training pants have layers of micro-terry cloth fabric as well as a layer of PUL (Polyurethane Laminate). Because they are toddler training pants, they are not fully waterproof, but they are made to catch small accidents that happen while toilet training. Blueberry Training Pants cost approximately $16 per pair, and come in the following sizes: small - 22-28 pounds, medium - 25-35 pounds, large - 32-42 pounds. Blueberry One Size Deluxe Diaper is a pocket diaper that comes in a variety of fun prints (I adore the owl print pictured on the right) and pretty colors as well as different fabrics and features to meet your own baby's specific needs. This diaper is designed to fit babies from 10-35 pounds and costs approximately $20-$25 depending on the type of fabric you choose. Absorbent layer made from microfleece or a 70% bamboo, 20% organic cotton, 10% polyester blend. 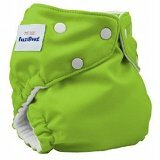 The Blueberry Coveralls Baby Diaper Cover is a one size diaper cover designed to fit babies from 10 to 40 pounds. It is designed with three rows of snaps that you can use to adjust the rise of the diaper cover so that it will fit your baby as he or she grows. There is also a smaller version available called the mini-coverall, which comes with the same adjustable snaps and fits babies from 6 to 18 pounds. Blueberry Coveralls diaper covers come in many of the same gorgeous colors and prints you expect to see in the Blueberry Diapers line of products. They are available with either snap or hook and loop closures, and prices range from about $15 to $17. The Diaper Laundry Bag is available in several of the same solid colors and prints you will find in the Blueberry diaper line of cloth diapering products. It can be hung up by the drawstring and used as a diaper laundry bag or placed inside your diaper pail and used as a combination diaper pail liner and laundry bag. The cost of this diaper laundry bag ranges from about $22 to $24. Blueberry cloth diaper inserts are available in one size microterry , a combination of bamboo and organic cotton fleece, and a combination of microfiber terry and organic cotton and hemp . The inserts can be folded and snapped together to create different sizes to meet your baby's needs.